On Thursday night, I will eat pumpkin pie on Thanksgiving for the first time in this millennium. As you may know, I’m a picky eater. My first memories of pumpkin pie are of me thinking that it looks mushy, and that’s not a texture that I like. I did give it a try one Thanksgiving night, and I know it was before 2000 because I remember we were in our old house. Just as I suspected, it was mushy, and I didn’t like it. Last year, at Thanksgiving dinner in Pennsylvania, I as usual passed on the pumpkin pie. On the Sunday after Thanksgiving, I was on the long flight back to California. It’s a longer flying time than the eastbound flight, and it feels eternal. By the time they served dinner, I was bored and hungry. I was at that point where anything would taste good… I can’t believe the things I’ve eaten on planes out of desperation. I finished the main part of my meal, and as a special treat, they served a slice of pumpkin pie for dessert. I was still hungry, and went for a bite. Wow, it was good. And not just good because I was hungry; it was legitimately delicious. So delicious that I was really mad at myself. I was sitting there enjoying airline food after passing on the homemade version just a few nights before. 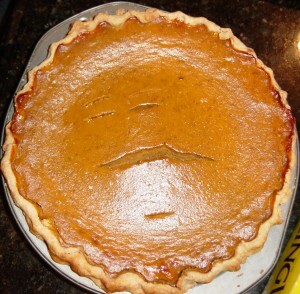 I promised myself that at the next Thanksgiving dinner, I would eat pumpkin pie. I can’t wait. When I was a youngin, I was quite the picky eater as well. However, pumpkin pie was one thing I absolutely loved. I’m not exactly sure why. It certainly looks like something that I would have hated.